22oz bottle purchased as a single from somewhere localish. Poured into an imperial pint glass, formed a 1/4" bright white head over the cloudy golden brew. Head is promptly down to a skim, with fluffy lasting lace. Aroma is clove and bananas, as it should be. Taste starts sweet, cloves in the middle, bananas through the close. Mouthfeel is smooth, and drinkability is easy. Good brew, most all as expected, and local sourced ingredients are just a bonus. Pours a big fluffy 1 finger head that rises over the top of the snifter, fades semi slowly with nice lacing, hazy cloudy hefe looking, golden carrot orange color. Nose starts with typical hefe aromas, plenty of wheat, light banana, hint of clove, light floral spices and light floral hops, light creamy fluffy malt. Taste is a bit different, it has some of the hefe flavors, light wheat, banana, citrus with slight orange and lemon zest, and hint of clove, but that starts light and comes on stronger towards the end. In the middle is a nice malty ale, with toasty and grainy pilsner like malts, a light creamy ale taste, and more of a clean crisp flavor. There are light fruits and some very light grassy floral hops. The finish is much more hefe, with a slight sticky but dry finish, long lingering wheat and some banana, hint of spices, and stronger bitterness. Orange citrus flavors really come on towards the end. Mouth is med bodied, fluffy and creamy, with lots of carb. Overall pretty good, it takes the nicer parts of the hefe and cuts down the overbearing parts with a nice toasty ale in the middle. For me hefes are tasty but, surprisingly, not that drinkable since there is so much going on, bitterness, spices, citrus, thicker mouth coating etc, but this helps make that go by much easier. 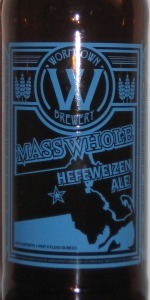 This is Wormtown's newest all Massachusetts ingredient beer, a hefeweizen. This is 13 IBUs and is brewed with 4 star wheat (Northfield) and Magnum hops and Czajkowski grown Valley Malted (Hadley) barley. A - Poured into a Valley Malt tulip a slightly hazy golden straw with a nice half finger white head that fades to leave a thin blanket and light side lacing with a nice halo. S - Aromas of light spicg wheat grains with light banana and a firm clove presense. A very lightly aroma'd hefe with more of a clove front than a banana one. A nice change. T - Hmm okay. Unlike the nose there is alot more banana in this. The yeast, wheat, banana, and cloves makes this almost taste like a liquefied slice of banana bread. Strong cloves don't overpower the nice ripe banana flavours with a very slight subtle spice from the wheat. This is well, surprisingly good. Wormtown makes some good beers but this exceeded my expectations. Excellent balance between cloves and banana. M - Mouthfeel is a bit higher carbonated than I'm used to with a hefe. That said, it works nicely with their representation of this style. O - Overall I was rather pleasantly surprised with this beer. A very nice refreshing take on the style with really good flavours and aromas. A: Pours a cloudy gold with a big fizzy white head. Almost soda-like head in fact. Head fizzes away pretty quickly with decent retention at least. Almost zero lacing. S: Strong wheatiness with oranges. A little grass. Bunch of cloves, especially when swirled. T: A little orange and then bananas and lots of them, from start to finish. Particularly in the middle though. Wheaty malt sweetens it a bit. Cloves in the finish primarily. M: Surprisingly medium bodied. Carbonation is quite high. Just a little too high, IMO. O: Not a bad hefe but a little uninspiring and plain. I'm not sure what it is, just doesn't have that crisp refreshing taste and aroma that a lot of hefes do. This just seemed a little too mellow for me. Easy drinking though, I will give it that.